"Do not think that I have come to abolish the Law or the Prophets; I have not come to abolish them but to fulfil them." For many Christians, conditioned to emphasize our freedom from the law, Jesus' words seem strange, even incompatible with the gospel of grace. If Jesus did not abolish the law, then how should we look at the Ten Commandments today? Clowney explains how Jesus intensifies the law and expands its scope to every situation in life. But as the author did so often during his ministry, he goes further, finding Christ in the law and showing how he fulfils it for his people. Thus believers will learn more not only of God's character revealed in the law, but also of the gospel with its focus on Christ. Divided into eleven chapters, each with study questions for reflection and application, this book is an ideal resource for group study and personal growth. "The great expounder of biblical theology, Clowney guides us between the errors of lawless license and graceless legalism through this magnificent study of the Ten Commandments." "Here, Edmund Clowney writes simply, but profoundly. Nobody had a deeper understanding of how all Scripture witnesses to Christ. I highly recommend this book for adult classes in churches, and for all who seek a better knowledge of the Lord Jesus." - Publisher Look at Jesus' teaching about and attitude toward the law. Examines how his life and death transform Old Testament law, as summarized in the Ten Commandments. About "How Jesus Transforms the Ten Commandments"
Look at Jesus' teaching about and attitude toward the law. 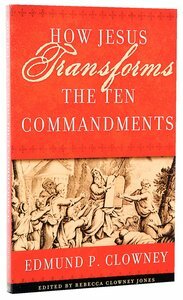 Examines how his life and death transform Old Testament law, as summarized in the Ten Commandments. Rebecca Jones is an historian and researcher of environmental history and the connections between human health and the environment. She has published on topics ranging from soil and organic farming to oral history and mental health and well-being and completed a PhD about Australian organic growing. She lectures in Health Ecology at Monash University. Customer Reviews For "How Jesus Transforms the Ten Commandments"
Some people say that the 10 commandments is about law, not grace. But Clowney shows that it's not about law at all - it's about Jesus! Clowney goes through each of the 10 commandments and shows us where Jesus in those laws. This really gives a new light to a very familiar passage that people think is irrelevant for us who live in the new testament. It's also written in a simple and straight forward way that everyone can read it - no prior theological knowledge is necessary.